Senior Palestinian Authority official asserts the body is at war with the Jewish state and that new talks are unlikely. Senior Palestinian Authority (PA) official Saeb Erekat divulged new details about one of his assistants who has been accused of spying for Israel and was captured by Palestinian intelligence. According to Erekat, the alleged spy was in charge of supplies at his office and was not one of his advisors. Following his interrogation he will be brought to trial by the Palestinian Authority. Erekat served as the secretary-general for the PLO and headed the Palestinian negotiating team during peace talks with Israel. He often threatened Israel with ending the security agreement and worked hard to stop Israeli political efforts abroad. While answering a question posed by Hamas-affiliated newspaper Al-Risalah, Erekat said the reason Israel wanted to place a spy in his office was because “the Palestinian Authority is waging a war in every sense of the word against Israel." 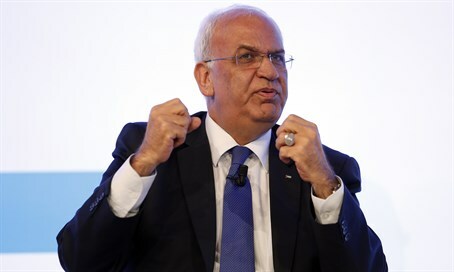 Erekat dismissed the idea of a new round of talks with Israel, saying that discussions have been frozen since 2014. While the steering committee of the PLO has agreed to a renewal of relations with Israel in the realms of security, economy and the political sphere, he noted, these relations have yet to be implemented. “Israel is interested in a Palestinian Authority that has no political or economic power. It is continuing to encroach and attempting to occupy our land at any cost, and to keep Gaza outside of the control of the Palestinian Authority,” added Erekat.